LinkedIn Summary: The Vice President is doing a great job in his U.S. tour, making a case that Nigeria is open for tech business and investment. We need that; I am a fan. But his press secretary is getting carried away after Mr. Vice President met Google CEO this week. Today’s press release was a mistake: “Buhari administration would be actively supporting Google’s Next Billion users”. Nigerian government cannot “actively” work to support Google’s quest for the next billion users. Rather, Nigeria should get Google to help execute its ICT Strategy. If Google follows and assists, it could get its numbers to get another billion of users. You cannot use a national asset to bless Google in this way [Google may not even care; it is a planet while Nigeria is just a country]. Yes, the same press secretary will never be generous to Nigerian companies like Remita, IrokoTV, etc in their visions for the next 1 million users. Nigeria must support ALL but not anyone. I will not like to read how Nigeria will help Instagram to get 5 billion users. Rather, how Instagram will connect into Nigeria’s ICT Strategy and working on that get its 5 billion users. I am confident that our National ICT Strategy would be given to Google, Facebook, etc. It is their jobs to see how they would adjust to execute their business models within it. Their strategic visions should not concern Nigeria. Mr. Vice President, safe travels. 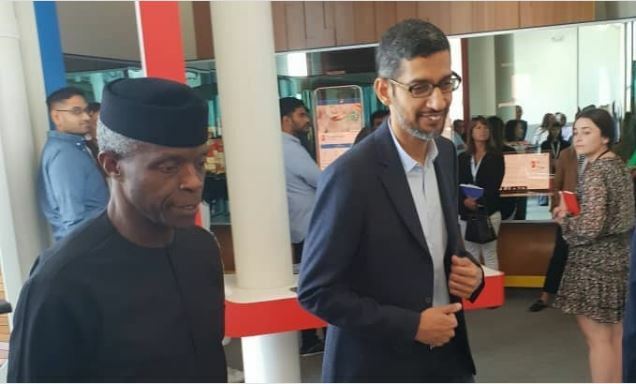 Our Vice President, Prof Yemi Osinbajo, met Google executives in California this week. He is touring America as part of the much needed branding of Nigeria to technology powers around the world. Possibly, more people will know of Yaba tech cluster than those “I have money to send you” emails. He is doing great; I am a fan. Nonetheless, they need to check the person who is writing the press releases. I have some kind words for him or her. The press release today that Nigeria is committing to help Google in meeting its Next Billion users is out of order: “Buhari administration would be actively supporting Google’s Next Billion users”. In line with its Economic Recovery and Growth Plan, especially its strategy to diversify the economy by making technology an enabler for forex revenue earnings, the Buhari administration would be actively supporting Google’s Next Billion users plan intended to ensure greater digital access in Nigeria and around the world. Certainly, that is not what the Vice President is projecting as he travels the world. No nation should be seen working to help a (foreign) company in executing a business vision in this way. Google should key into Nigeria’s ICT strategy and not the other way around. If Nigeria plans to be on auto-pilot on Google plan, we would cause problem as Facebook, MTN, Glo, and other technology companies will cry fouls. Google has gotten its first billion users. It also got second billion users. …That it want another billion users should not be a national importance that Nigeria should “actively” support. Google is doing great for Nigeria but Google will not fix the Nigeria technology space. It is a company built on aggregation, delivering marginal value to partners while it keeps most of the value. Our Vice President possibly has the ICT plan from the Ministry of Communications. I know the Ministry of Science & Technology has its own version. They should share them, focusing on what Nigeria wants to do over what Google plans for the world. If Google wants to do whatever it has to do, it has to link into our national ICT strategy. We are a nation, Google is just a company. Let us borrow models from China where the nation sets its ICT plan and anyone that wants to do business there follows them. Possibly, through that plan, Google will get its next billion users. Our nation must support ALL but not anyone. Google can get 100 million users from Nigeria because Nigeria’s ICT strategy has a plan to bring users online. But the essence is not to help Google next billion users. Please, press writer take note. Do not tell us that Nigeria is going to help Instagram reach 3 billion users by next five years. Focus on Nigeria’s ICT strategy and what the nation offers to help any of these nations meet their strategic visions. Your statement today from a national government is unnecessary. I am not sure if you can send such on behalf of Remita, Zinox, etc which are our indigenous firms. Mr. Vice President, thanks for the trip and continue to tell them that we have brilliant minds in Nigeria. We need capital in the land; safe travels.